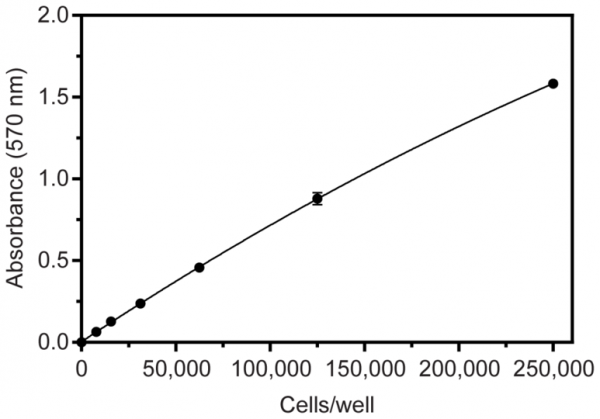 Product information "MTT Cell Proliferation Assay Kit"
Cayman's MTT Proliferation Assay Kit provides an easy to use tool for studying the induction and inhibition of cell proliferation in any in vitro model. This kit will also allow investigators to screen drug candidates involved in cell cycle regulation. In this assay, MTT is taken up by cells through the plasma membrane potential and then reduced to formazan by intracellular NAD(P)H-oxidoreductases. Customer review for "MTT Cell Proliferation Assay Kit"